When a hiker comes from Bad Sobernheim through the Entenpfuhl State Forest, passes by Trifthütte (a pasture hut and restaurant) and Alteburg Mountain, and arrives at the main ridge of the Soon Forest, they are suddenly met with a breathtaking view over the Hunsrück plateau and down into the Simmerbach valley. In the valley below lies the little town of Gemünden with its numerous 17th and 18th Century half-timbered houses, which are worth seeing. A four-turreted castle towers above Gemünden, standing high above the houses on a rocky plateau. The four mighty turrets with their bulbous spires give the Baroque castle quite a distinctive and unique character. With good reason, Gemünden is called "the pearl of Hunsrück", with a city charter that dates from 1330. 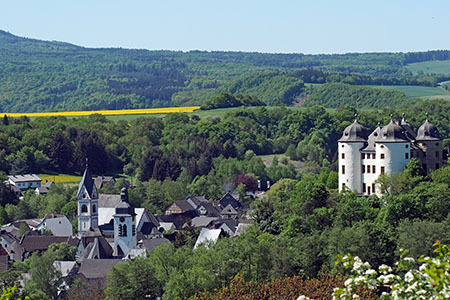 Between 1514 and 1540, the Lords of Schmidtburg Castle near Bundenbach in Hahnenbach Valley purchased the entire town, including its 12th century castle, as part of the sponheimian legacy. A short time later, the centre of Castle Gemünden arose in its present-day form. After being destroyed by French troops in the year 1689, it was reconstructed between 1718 and 1724. A hundred years later, in 1815, the castle came into the possession of the baronial family of Salis-Soglio through the marriage of the last heir to Captain Anton von Salis-Soglio from the canton of Graubünden in Switzerland. From the main ridge of Soon Forest, the path to Gemünden leads down into the valley passing near the ruins of Castle Koppenstein (553 m), around which a small settlement once stood (ca. 1330). Koppenstein is numbered amongst the oldest properties of the Sponheim Earls in Hunsrück. Despite its strategically favourable position at the junction of the road that links the Nahe and the Mosel Rivers over the Soonwald main ridge, the castle and settlement were once again abandoned by the end of the 16th Century. This was due to adverse agricultural and climatic conditions. A further reason might have been the permanent lack of water. Yet what remains is certainly an unparalleled view from the keep of the ruined castle over the Hunsrück Heights. A geological "learning path" in Gemünden leads through the 320-million-year-old, petrified Devonian sea in Hunsrück. Fossils from prehistoric plants and animals bear witness to a long ago past: the Devonian period with maritime flora and fauna from 350-405 million years ago, and the creation of Devon-Taunus quartzite and Hunsrück slate 320 million years ago. The main area for this is the Kaiser quarry with its beautiful view over the little town. This slate quarry is famous for its abundance of fossils and the extraordinarily good condition they are in. Spectacular finds of classes of armoured fish ("Placoderms": plate-skinned), bony fish ("Osteichthyes"), and jawless fish ("agnatha") in the 19th Century established the basis for the fame of this quarry. The findings here have added substantially to the list of the fauna from Hunsrück slate, and, above all, made it possible to determine the exact age of the slate strata. In contrast, the characteristics of today's Hunsrück surface area are much younger and are the result of tectonic movements one million years ago, as well as weathering. The Herrenberg slate quarry near Bundenbach is also a diversion worth making. It is in the area of Rhaunen and has a large fossil collection of Hunsrück slate from the Devonian era. Short glossary of geological terminology.